Kaso vault doors are burglary certified to grades II, III, V, VI, VII, IX, X and XII according to European Standard EN 1143-1. Vault doors VD-A, VD-3, VD-5 and VD-6 are also classified with 120 minutes fire protection according to EI 120. VD-2 vault door is classified with 60 minutes fire protection according to EI 60. The vault doors and strong room doors can be used on their own, installed to the concrete wall or as part of prefabricated strong rooms. Vault doors can be also installed to offices where the look of a fire door does not match the rest of furnishings. Wide range of options are also available for Kaso vault doors for meeting the specific design and security requirements. Kaso VD-10 vault door is burglary certified to grade X EX CD according to European Standard EN 1143-1. 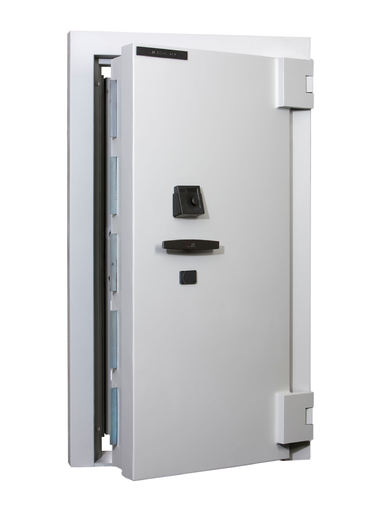 Wide range of options are also available for Kaso vault doors for meeting the specific design and security requirements of the installations.